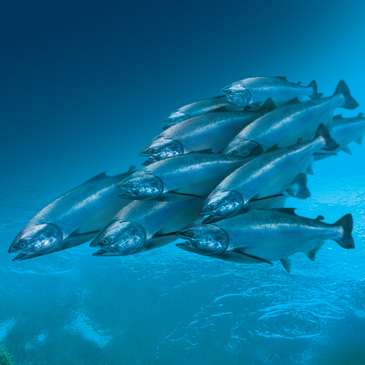 New Zealand farmed King salmon are recognised among the world’s greenest farmed fish. Core to the industry is an unwavering commitment to sustainable practices. No one has a greater interest in protecting the marine environment than the farmers who depend on it for their livelihood. The quality of the water directly affects the quality of our products, our lives and our future. Farmers follow Environmental Codes of Practice, independently verified as world-leading, that direct best industry practices throughout growing and harvesting to minimise potential effects on the environment. A combination of pristine waters, outstanding farm management and strict biosecurity procedures mean that King salmon are raised naturally in New Zealand. In New Zealand, salt water salmon farms are located in deep waters and have good tidal movement. A great deal of scientific analysis and planning goes into choosing the right site to ensure any environmental effects are minimal. Our fresh water farmers proudly state that the water passing through the farms is so clean, you can drink it. Global Trust Certification Ltd also rated the New Zealand salmon industry as first class with one of the most robust environmental regulatory frameworks in the world.